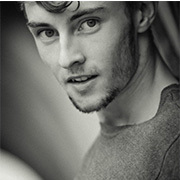 David Ledger began his studies at Rambert School in 2009. After his Foundation Degree, he joined Nederlands Dans Theater 2 in 2010. Upon completing a season as an apprentice, he was given a full contract and toured worldwide with the company until 2014 in pieces by Jiri Kylian as well as by other leading choreographers such as Ohad Naharin, Alexander Ekman and Lightfoot Leon. He is now working as a freelance performer based in London, and most recently danced with Wim Vandekeybus.